The history of Serbia’s involvement in World War One can basically be split into two phases. In the first, following the first attempted invasion by Austria-Hungary, the Serb Army successfully defended its country against several invasions until overwhelmed in the autumn of 1915 and deciding on a long and terrible retreat through Albania, from where it was evacuated to Corfu. After recovering and reequipping on Corfu, in July 1916 the Serb Army moved to the Salonika front, where it served for the remainder of the war, eventually liberating most of Serbia from the Central Powers before the armistice. Such success, particularly for a smaller nation against much larger powers, inspired much admiration from her allies, but apart from a truly terrible set from HaT this is the first time Serbia’s armed forces have been properly depicted in this hobby. The most distinctive feature of the Serb uniform in 1914 was the cap with the indentation running front to back, which most of the figures in this set are wearing. For the soldiers this has no peak, but the officer’s version does have a peak, which is fine. The rest of the uniform is obscured underneath the greatcoat, which is a calf-length double-breasted style with two thigh pockets, which matches well with the standard M1908 greatcoat worn by front line troops at the time. After the army was refitted in Corfu they were supplied with French and some British uniforms, and the greatcoat modelled here could also be the French garment. Underneath the coat the legs show that some have ordinary puttees and short boots while others wear the traditional Serb opanci footwear; the latter being less likely in first line troops, though perhaps not inconceivable. Finally, three men wear a helmet of the French Adrian design, which helps with our consideration of the dating of this set below. All the men have a pair of ammunition pouches on the front of the waist belt, and none at the back. They have a haversack on one side or the other, and a water bottle high under the arm on the left side. Quite apart from the impractical positioning, the circular design matches no Serbian or French version of this item, nor that of any other belligerent in the war, so is a mistake. The bayonet scabbard on the left hip completes the kit roundup, since none of the men have a pack or other impedimenta. When discussing the weaponry in this set we have to include our observations on the possible dating of the set, and highlight a serious problem. 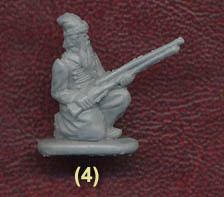 Most of the men are holding a rifle, as they should, but the design and sculpting of this weapon is nice and clear, yet has some details which we cannot attribute to any of the many different models of rifle the Serbs used during the war. Painting or trimming will remove the offending detail, but we still wonder what was intended here. The officer has a sword, which might have been better left behind before going in to the attack, but is holding a revolver, which will also be of little use but is at least easier to handle. One man holds a stick grenade, something used in the first phase of the war but not issued later on by the Allies. That just leaves two men with specialist weapons. In the last full row, next to the officer, is a man holding a French Chauchat. This was not a great weapon, and was only used by the Serbs after being supplied to them in early 1917, so that helps to date these men to the second phase of their war. Next to him is a man holding a Lewis gun. Oh dear. The Serbs were never issued with, and nor did they purchase, any Lewis gun, so this is a waste of plastic only good for the bin. What is worse, the designer has the man holding it by the stirrup handle placed mid-way along the barrel, a device that was only added in 1920, so another reason to chuck this figure away. It should also be noted that the Adrian helmet worn by three of these figures was only worn from 1916, which backs up the later-war date, although the rest could still work for the first year too. Having discarded the useless Lewis gunner, we are left with 10 privates and the officer. The poses are generally fairly standard and mostly well done, with the last figure in the top row being our favourite. However much the worst of the pack is the man in the third row holding a grenade. This is about the most unconvincing, flat and generally poor grenade pose we have ever seen, and quite clearly in this posture he can throw nothing, so not much to be done with that figure either. The man with the chauchat is interesting in that he fires from the hip (no easy task), so is steadying his weapon by the magazine rather than the pistol grip, which is easy to understand. This is one of the best sets Strelets have yet produced in terms of the sculpting quality. The figures are nicely proportioned and the detail is good even in areas like faces, hands and weapons. Without the old over-sized style these would mix well with output from other companies, and are quite pleasing to look at. Add to that the almost complete lack of any flash, and clearly much skill has been put into the production of this set. It is a great pity when a really nice set is damaged by sloppy research, although at least the post-war Lewis only makes one of the poses unusable. The poorly done water bottles are small enough to have little impact, and the mystery rifles can be easily ignored, but we did wonder why the officer, of all people, has not got the indented cap so proudly worn by all Serb troops. The Adrian helmets should also have a badge on the front, so there are a number of small niggles. The biggest niggle however is the confusion of dating for this set, which as we have said has elements from both early and late war. In particular, once a unit was issued the Adrian helmet it is likely all wore it, so the mix of headgear here is artificial. Equally, after refit on Corfu it is very unlikely that the men wore the traditional opanci, so this is another early war feature that conflicts with the late war elements. So while the figures are fairly accurate individually, which is reflected in our score, it would be very unlikely that they would be placed together as they are in this set. However the production quality is good and while we were not impressed by the officer’s posture, the remaining 9 infantry (ignoring Lewis gun and grenade man) are reasonable and in some cases quite energetic. Some silly mistakes then spoil what is a very decent if somewhat confused set, most of which will work well for an oft-forgotten theatre of the Great War.